Screen shot of Terra Nova's FTC budgeting tool. This tool is great for team budgeting, planning purchases, grant applications, and your team Business Plan. Current parts and team-discounted prices up to the date included in the spreadsheet filename. All Tetrix parts applicable to FTC. Certain useful Tetrix tools, such as hex wrenches, chain brakers and tube cutters. Key HiTechnic Parts applicable to FTC.such as Sensor Multiplexers and Prototyping Boards. teams building a complex robot. 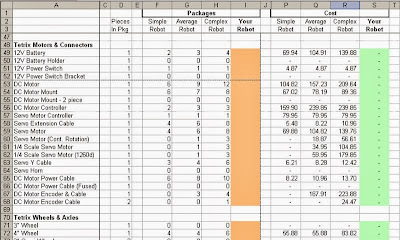 and of course the orange column for your parts estimates for your robot. Miscellaneous factors such as part failures, redesign, mistakes, etc. Places to enter one-time costs such as laptops. Most of the spreadsheet is built to automatically calculate costs based on the quantities of parts you estimate for your robot.